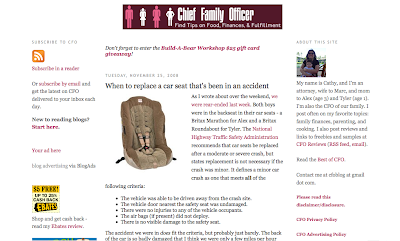 Chief Family Officer is our featured member blog, part of the share-the-readers program for BlogCoach Community members. I'm a full-time attorney, wife and mom to two young boys. I started Chief Family Officer back in 2005 when my oldest was a newborn, and it's been interesting to see the blog evolve as my family grows up. My favorite topics to discuss are family finances, parenting and cooking. I generally publish a new post every day, and my great hope is that readers will be able to relate to what I'm discussing and gain something from reading about my experiences.